Hi all! I love Paris probably more than any other city out there. I have been about 7 times and even studied music and architecture abroad there for 5 weeks in college (the more you know!). I was just in Paris in September and did some awesome things like a “No Diet Club” biking food tour and an Eiffel Tower champagne adventure. But I also had the chance to explore Disneyland Paris for the very first time. 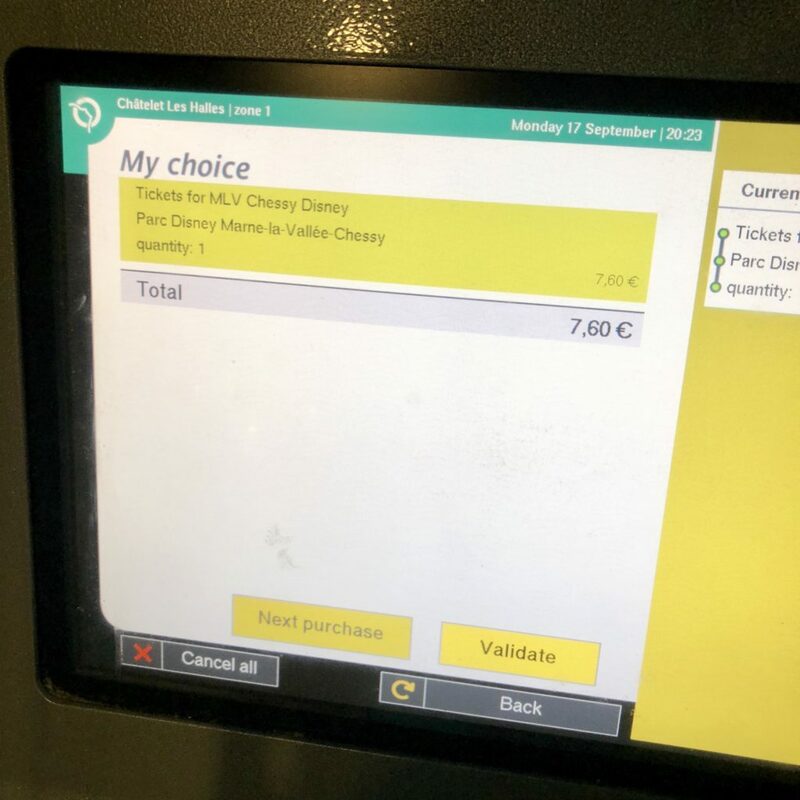 I wrote a general recap of my solo visit to Disneyland Paris, and wanted to share some directions and instructions on how to take the train to Disneyland Paris on the RER A train! I think it is the easiest way to get to the park if you don’t have a car rental or if you’re not staying at one of the Disney hotels. As you might know, I am kind of a Disney parks fan and try to go to the Orlando park whenever I can. We were there in the fall for the Epcot Food and Wine Festival, which is one of my favorite times of year to visit! But let’s get on to the directions for getting to Disneyland Paris from downtown Paris. 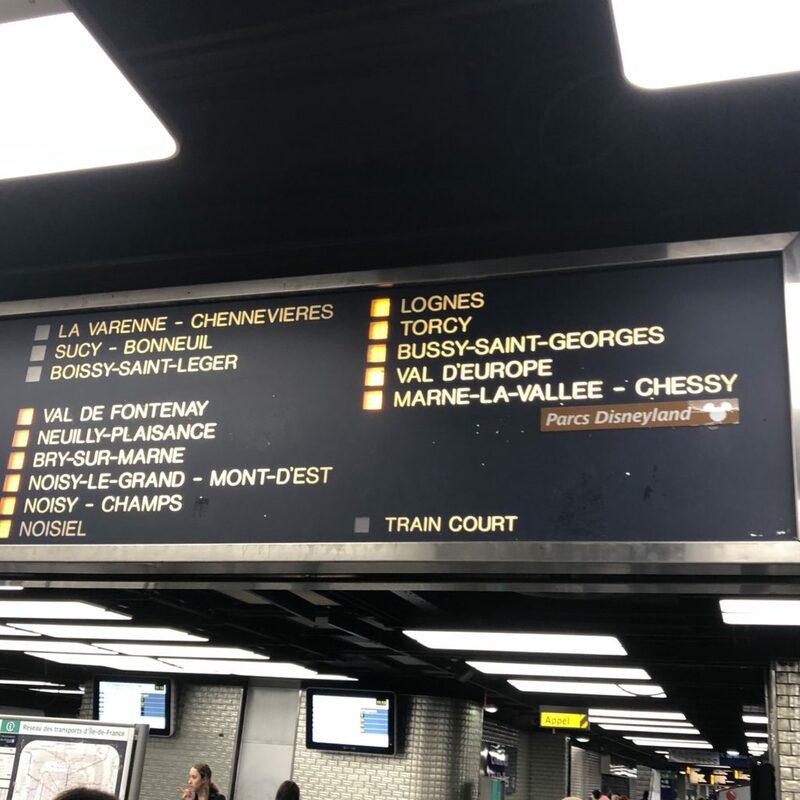 To get to Disneyland Paris from central Paris, you need to find your way to one of the stations that services the RER A line. The RER is like a commuter rail or regional rail. 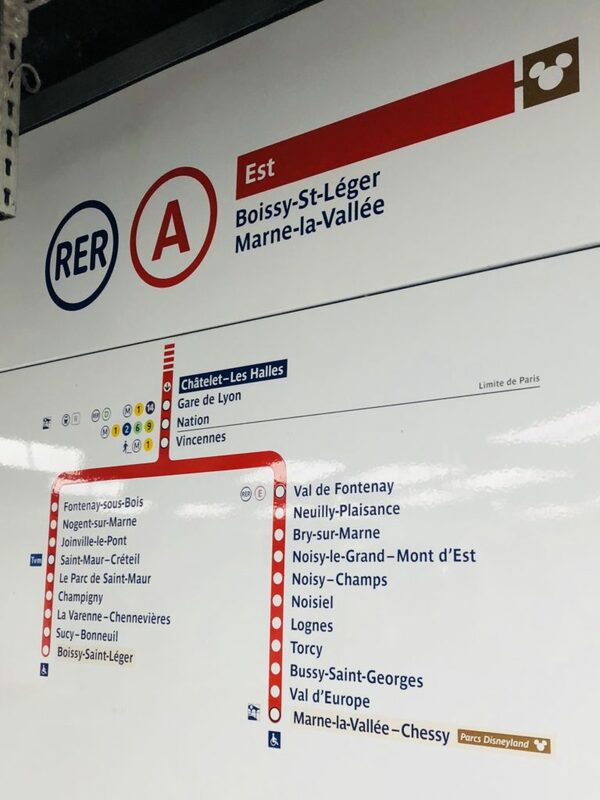 You can easily connect to it from the Paris Metro system and from other RER lines (RER lines are names A—E and run to the suburbs of Paris). 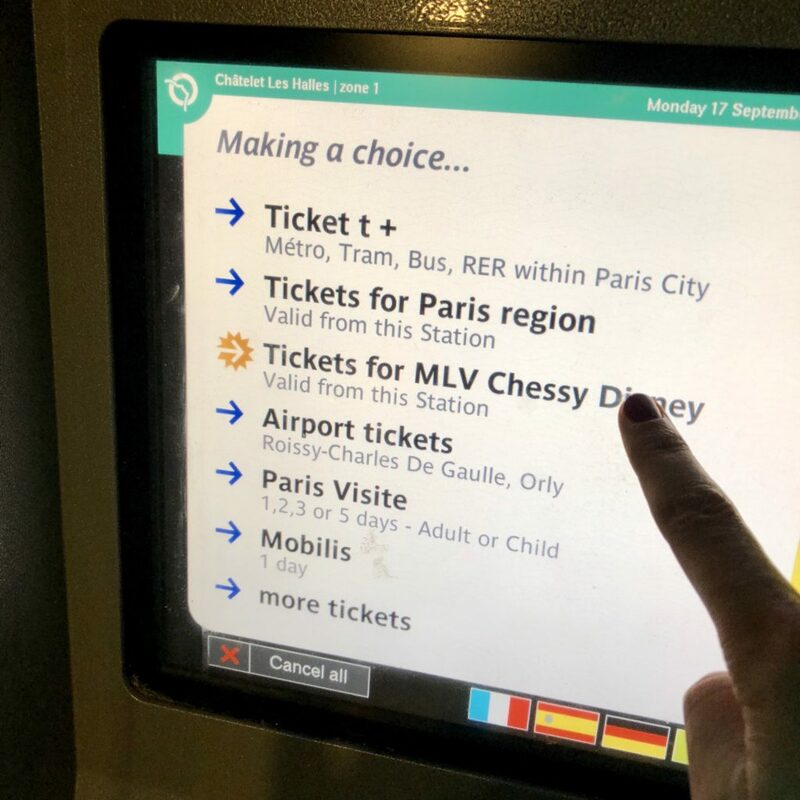 You can buy tickets for the train to Disneyland Paris from any machine that says “Navigo” or has the RER logo on it. Select your language. Thankfully, these machines offer English instructions! Select English and proceed to the next step. 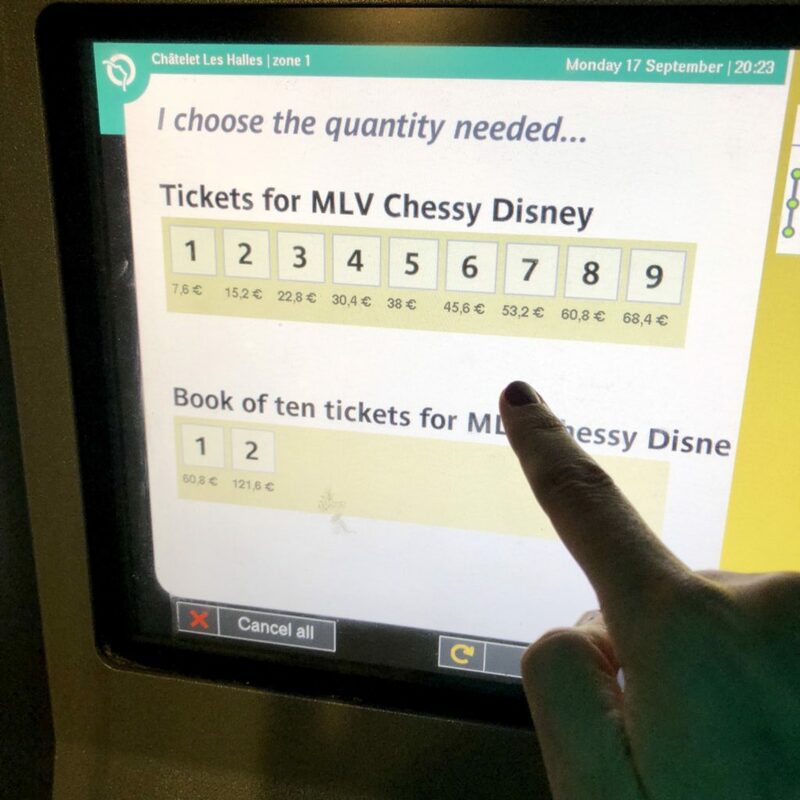 Select tickets to MLV Chessy Disney. Choose your fare—full fare for adults or reduced for children. 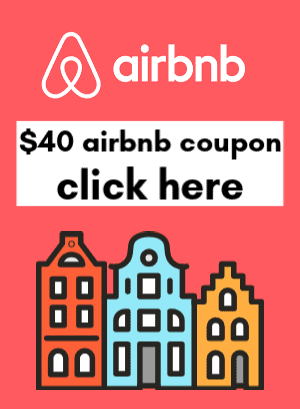 Buy 1 or 2 tickets, if you want to just buy both ways at once. They are 7.6 Euro each way and there’s no discount. Just be sure to not lose your return ticket! There’s no consequence but you’ll just be out the money. Pay by credit card. Well, I chose to pay by card. It was the easiest and fastest way to process payment. 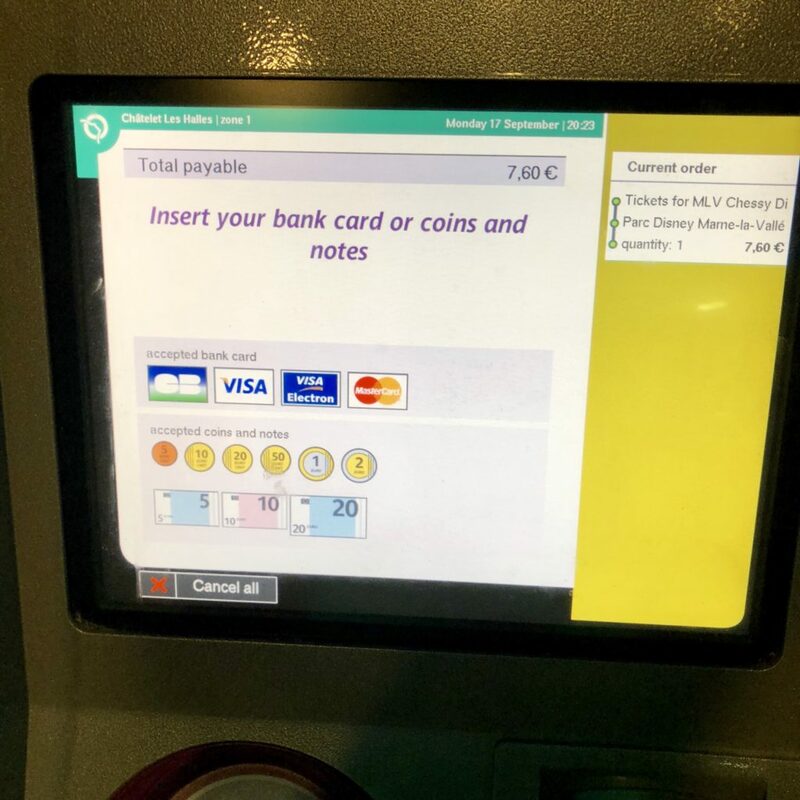 The machine will then spit out your ticket(s) and a receipt if you so desire. Proceed to the trains! If you are not already at an RER line, you CAN use this ticket to ride the Metro to the RER—woot! 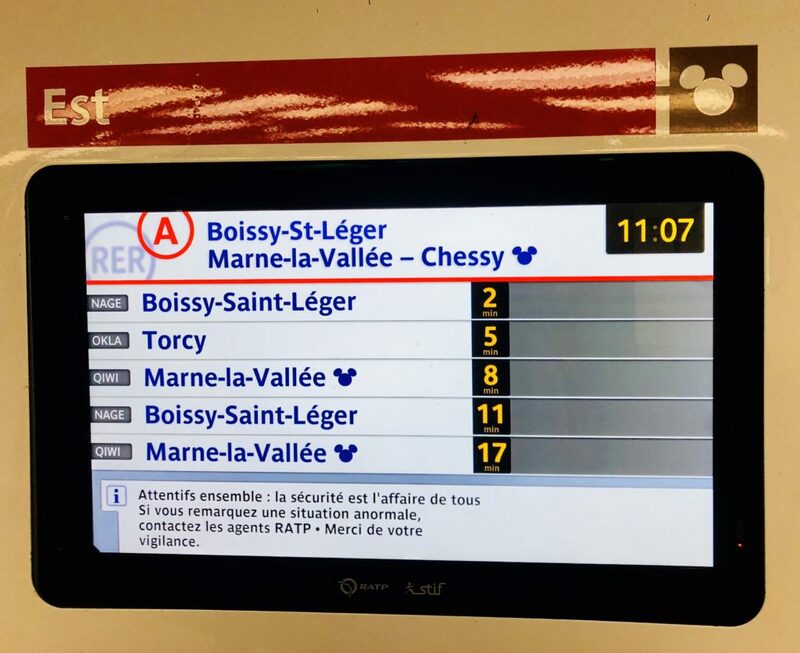 Once you’re at the RER A station, be sure to head in the direction of Marnee-la-Vallee – Chessy. The trains either go there or Boisst-St-Leger. Make sure you get on the proper train heading east! When you’re waiting for the trains to arrive, the final destination will be lit up like in this photo. You’ll probably also see kids and families boarding the Disney train, but just be aware that you board the proper train. IMPORTANT: hold on to your RER ticket!! You will need it to exit the station at Marnee-la-Vallee. Same with the return trip. You will need your other ticket to enter and leave the trains. The trip on the RER takes about 45 minutes to an hour, and it’s a pleasant journey through the towns just outside Paris. When you arrive at Disneyland Paris, it’s the last stop on the line. You exit the station by going up a few flights of stairs or you can take the escalator or elevator. The train to Disneyland Paris runs every 15 minutes or so and seems to be quite reliable. I definitely found it easy to manage and was the preferred way to travel for many others. It runs pretty much all day and night, so you can stay late and enjoy fireworks without worrying about getting back to Paris. For the return trip, just do everything you did to get there in reverse! 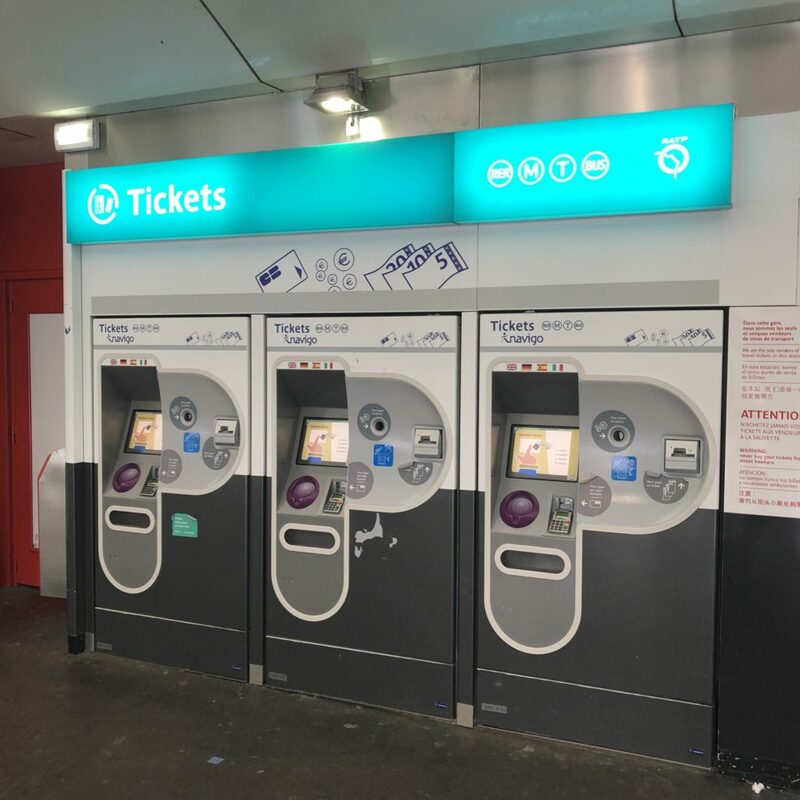 Your RER ticket will again work on any local Paris Metros if you need to switch trains once you’re back in the city center. 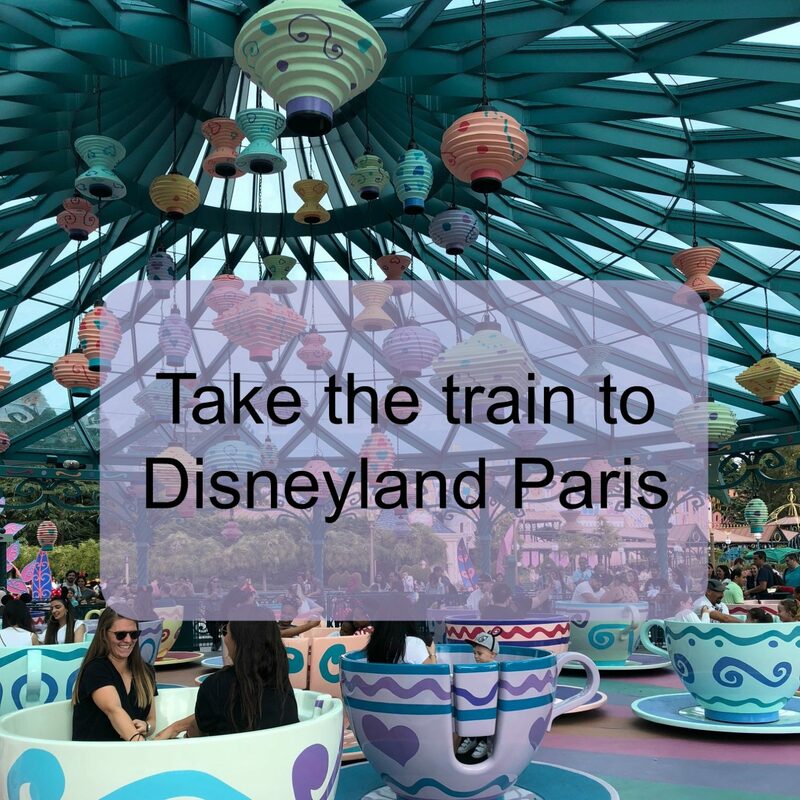 Enjoy Disneyland Paris, and I hope you find this guide on how to take the train to Disneyland Paris helpful! While you’re here, check out my top 5 packing essentials for Disney! Biodegradable sunscreen: Alba sunscreen goes on smooth and the white-ness rubs in quickly. It comes in a variety of SPF and scents like green tea, tropical fruit, or fragrance-free. Rain Poncho: Throw these emergency rain ponchos into your day pack.